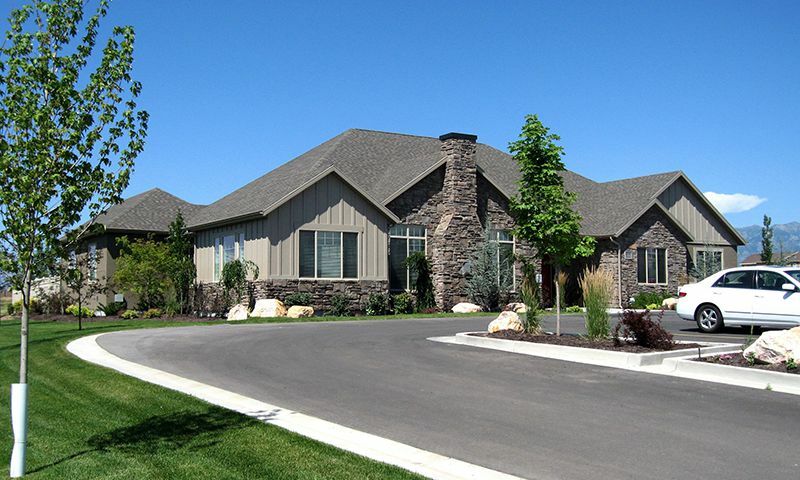 Sunset Park Villas is a 55+ community located in Syracuse, Utah, just outside of Salt Lake City. Attached homes are available on a resale-only basis, with 116 homes total in this intimate active adult community. Residents at Sunset Park Villas enjoy a variety of amenities that allow them to stay active as well as many activities and clubs put together by neighbors. The seasonal climate and natural beauty of the area adds to this community’s already appealing nature. The clubhouse serves as the social center for the community, where homeowners can easily gather to stay active and to stay in touch. Clubs and activities find a home in the meeting room and events are made easier by the on-site catering kitchen. Residents can catch up on the latest novel in the library or screen the newest blockbuster in the movie theater. Neighbors can challenge one another to some friendly competition on the billiards table. With an exercise room right inside the clubhouse, homeowners have no need to waste money on an expensive gym membership. The outdoor amenities at Sunset Park Villas are equally appealing. Residents can relax with friends on the outdoor patio, or go for a leisurely dip in the outdoor pool during the warmer months. There’s also a BBQ area, making it easier than ever to get a group of neighbors together for food and fun. Leisure Villas began construction on Sunset Park Villas in 2010 and concluded in 2014 with 116 attached homes. Sunset Park Villas includes expertly crafted homes in four different models with something for every homebuyer’s taste. The homes in Sunset Park Villas range in size from 1,602 to 1,971 square feet and feature two to three bedrooms, two or three bathrooms and an attached two-car garage. Many of the floor plans also feature an added den for more space. The homes at Sunset Park Villas feature luxurious options like outdoor patios for entertaining and fireplaces in the living rooms on multiple models. There are plenty of activities and outings available to the very active residents of Sunset Park Villas. While there is no on-site activities director, neighbors are proactive when it comes to organizing events for everyone to enjoy. Sporadic events like BBQs, game nights, and holiday parties are frequent affairs within the community. Additionally, there are a variety of clubs available at Sunset Park Villas. Residents gather to play games of chess together, go for evening walks through the grounds, or even take part in water aerobics to stay fit. A group of residents also holds regularly planned ladies luncheons. There is truly something for every interest at Sunset Park Villas. Sunset Park Villas is located in Syracuse, Utah, near a variety of local conveniences. Banks, restaurants, and several parks dot the area around this active adult community. A healthcare facility is just a five-minute drive away and residents are near Route 15 for further travel throughout Utah. For out-of-state and international travel, Salt Lake City airport is under an hour away by car. Residents of Sunset Park Villas also have access to nearby Salt Lake City, home to world-class dining, shopping, and entertainment. With many public parks, an arboretum, and a zoo, there is plenty to do within a quick day trip from Sunset Park Villas. Sports fans can enjoy the local Energy Solutions arena, where the Utah Jazz play. With so much to do and see in and around Sunset Park Villas, it’s clear why this 55+ community is popular in Syracuse, Utah. There are plenty of activities available in Sunset Park Villas. Here is a sample of some of the clubs, activities and classes offered here. The homes in Sunset Park Villas range in size from 1,602 to 1,971 square feet and feature two to three bedrooms, two to three bathrooms and an attached two-car garage. Many of the floor plans also feature an added den for more space. The homes at Sunset Park Villas feature luxurious options like outdoor patios for entertaining and fireplaces in the living rooms on multiple models. Please Note: We do not have floor plans available at this time. 55places.com is not affiliated with the developer(s) or homeowners association of Sunset Park Villas. The information you submit is distributed to a 55places.com Partner Agent, who is a licensed real estate agent. The information regarding Sunset Park Villas has not been verified or approved by the developer or homeowners association. Please verify all information prior to purchasing. 55places.com is not responsible for any errors regarding the information displayed on this website.